With Earth Day passed what about he other 364 days? We need to continue to think of way to keep our planet clean. Pick simple things you can do like reusable shopping bags or recycling your cardboard boxes and soda cans. Recycling doesn't have to be hard work. I was thrilled to get the chance to review this awesome container. My kitchen has built in garbage cans but I don't have anywhere to store by recyclables. I normally take them out at the end of the night. This bin has come in really handy. I use the top smaller bin for soda cans. That way I can just grab the handles and dump it right into my big outside bin. It's simple to clean out as well. The larger bottom bin I use for my cardboard boxes. It too has the easy to lift handles for easy carrying. This 2-in-1 recycler is a simple and easy way to live a greener lifestyle. Do your part to keep our earth happy! Disclaimer: Product was supplied to me by Rubbermaid. The opinions is this post are my own and honest opinon about this product. I saw the giveaway on bondwithcarla.com. 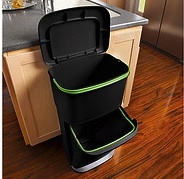 My favorite Rubbermaid product is the Stackable Recyclers, they don't take up much space & you can wash them out as needed. I found this on your e-newsletter. I recieve your newsletter so I found out about your giveaway from there. I found out about the giveaway and your site from twitter. I get daily emails from a site called Giveaway Promote. There was a link to this giveaway today. I found in the Email! !